It was beautiful, but the yarn I used was wrong for the project. It was too soft, the sweater grew, and I never wore it. I finally frogged it this past spring, and a couple of weeks ago I decided to reknit Wisteria as a dress. Pattern: Wisteria, by Kate Gilbert, from Twist Collective Fall 2008. Yarn: A DK weight merino/cashmere/silk yarn from Lambspun of Colorado. This yarn has been a few projects and has held up beautifully over the years. Modifications: The pattern converts into a dress without fuss. I added some bodice darts at the back to prevent “poofing” under the yoke, added darts in front and back (along with those at the sides) for smoother skirt increases, and shortened the sleeves to 3/4 length. 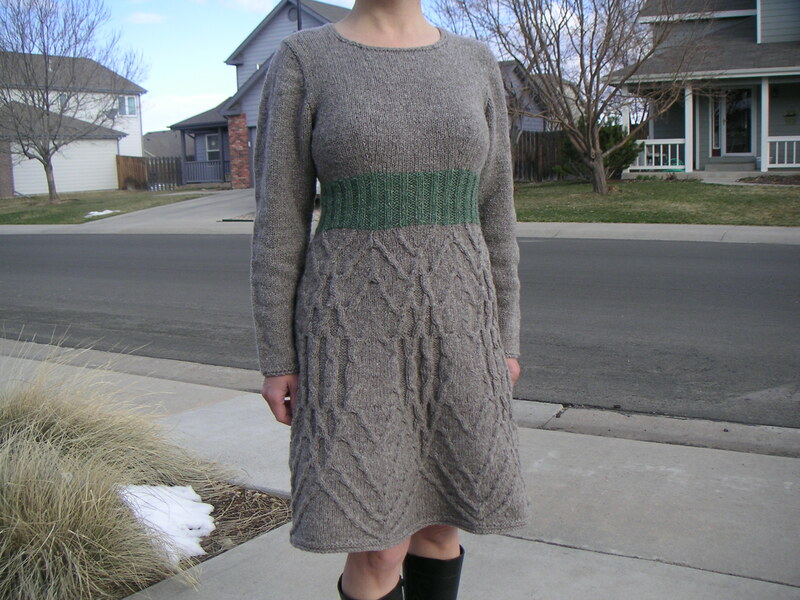 Thoughts: The yarn was perfect for this project; it is light, and the dress conforms without clinging. Again, the yarn was too soft, and the dress was incredibly clingy and picked up static like crazy. But I loved the pattern, so I reknitted the sweater this past spring. Yarn: Sport weight mule-spun Elsawool in undyed medium grey. This is a cormo wool, and I love it as much (if not more) than merino wool. Modifications: I opened up the neckline, and did not bother with the skirt hem. I knitted the sleeves on from the top using short rows to shape the caps. Thoughts: The pattern was as fun to knit this time around as last time. More important, the dress fits well without cling, and the cables still show up even with the darker yarn. 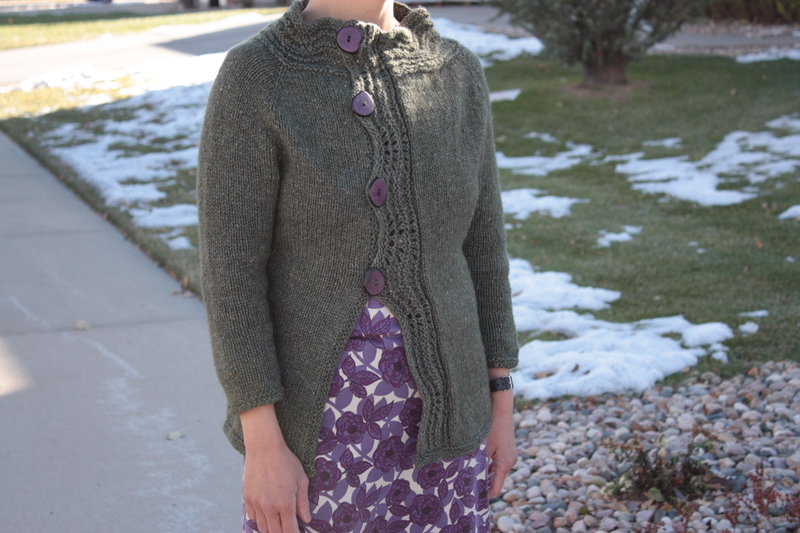 Pattern: Fuse Cardigan, by Veronik Avery, from Brooklyn Tweed Wool People Vol. 2, Winter 2012. Yarn: Woolen spun sport weight Cormo yarn from Elsa Wool Company, in medium grey. Modifications: It was a somewhat complex pattern from the shaping point of view, so I think the only thing I did was do the usual tweaks related to my short stature. Thoughts: It is a really interesting design, and I appreciate the fact that the cardigan looks good with the neckline draped as well as undraped! 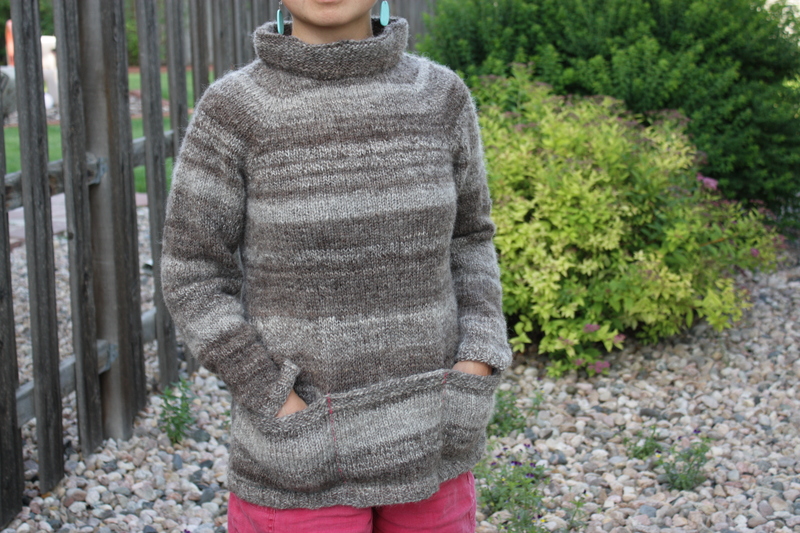 Pattern: Pentagon Aran Pullover, by Norah Gaughan, from Knitting Nature. Yarn: A merino wool-silk-cashmere yarn from Lambspun of Colorado, in clary sage. I bought this yarn years ago and in December recycled it from another Norah Gaughan sweater. It has held up very well. Modifications: I made the collar shorter, and changed the sleeves to top-down inset sleeves instead of drop-shoulder sleeves. Thoughts: Norah Gaughan rules! Knitting Nature has some of Norah Gaughan’s best designs; having said that, I really have to squint to see the pentagons . . . . Still, a great pattern that is a cool alternative to traditional arans. 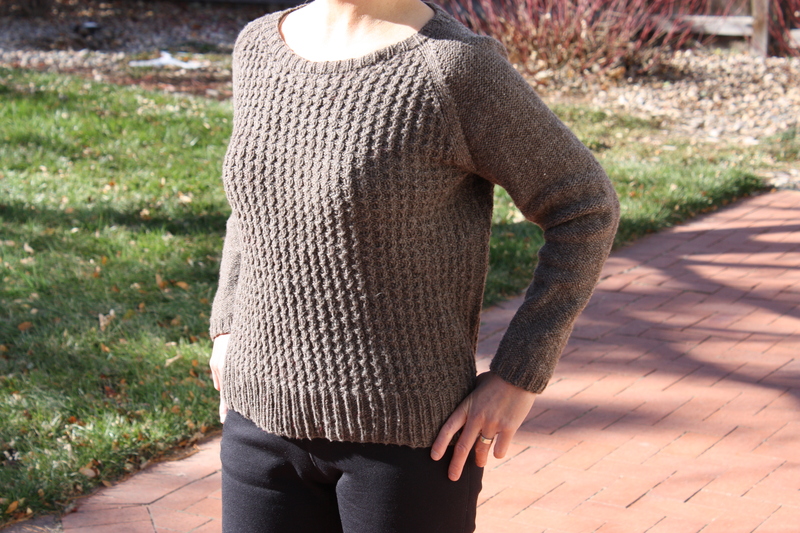 Pattern: Phyllo Yoked Pullover, by Norah Gaughan, from Knitting Nature. Yarn: Rowan Calmer, in mandarin (discontinued). I confess, I bought the yarn because of the Rowan mystique, and because the fiber makeup of Calmer intrigued me. The yarn was on closeout, so it was cheap . . . . but it was orange. No getting around it, it looks like orange sherbet. 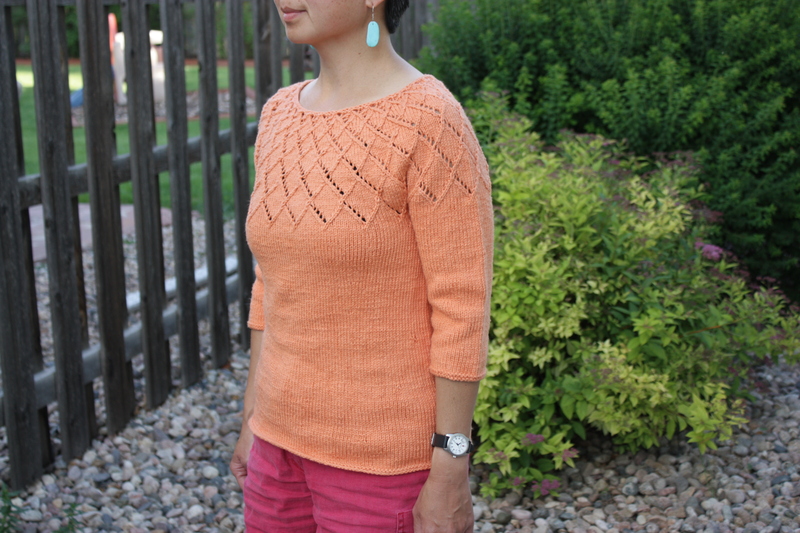 But, the yarn worked perfectly for the pullover, and surprisingly enough, I actually look good in orange! Modifications: I shaped the waist, shortened the sleeves, changed the depth of the phyllo lattice, and made the neckline smaller so it wouldn’t fall off my shoulders. Never did like the 80s off-shoulder thing . . . . Thoughts: To this day, I am not convinced that the phyllo yoke pattern works as presented in the book. Yarn: Handspun, undyed yarn from Lambspun of Colorado. 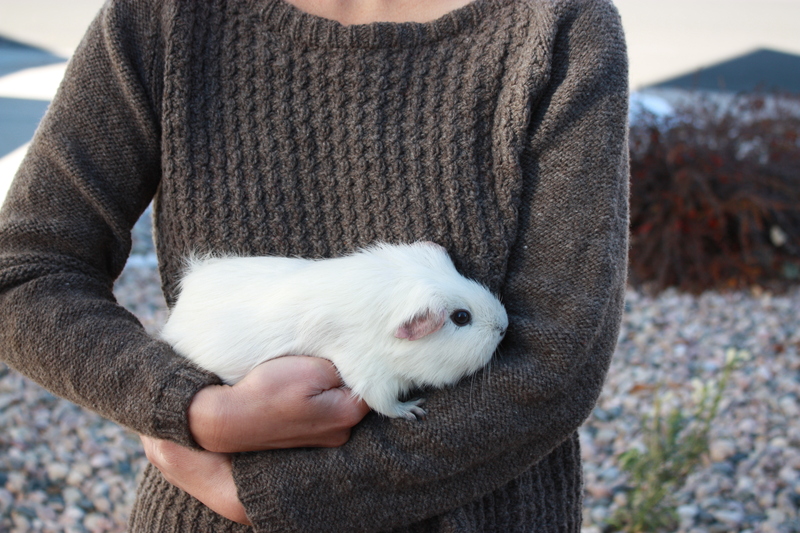 As with most of my projects these days, the yarn was recycled from another sweater. Modifications: I knitted the pullover in the round (I thought the yarn would be sturdy enough not to need seams for structure), and picked up the stitches for the pocket band from bottom and attached it next to the side seam (rather than sewn into the seam). I didn’t like the curl at the top of the pockets, so did a few rows of seed stitch. I also wanted to make the neck line narrower, but obviously did not succeed. Thoughts: This version of Kaari is more successful than version one, which got recycled into Freija. 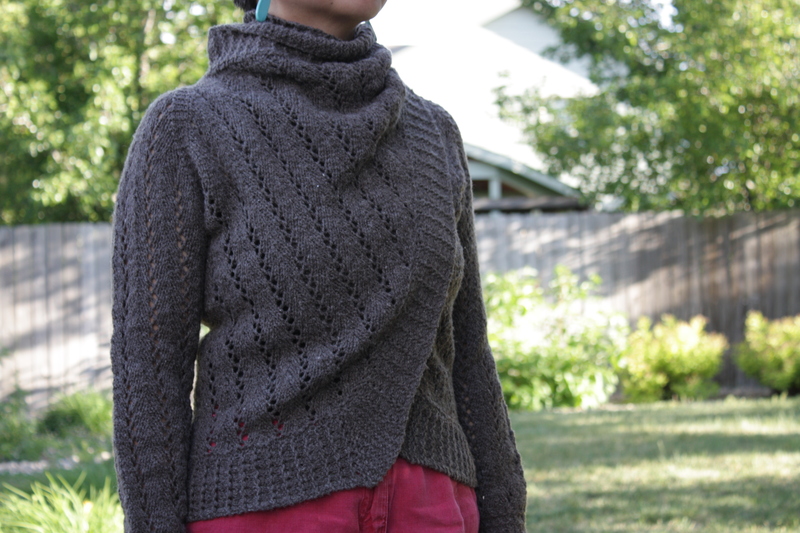 I wish the neck were narrower, but other than that, I like the pullover, and the rusticity of the handspun wool is perfect for the whole conception of the sweater. 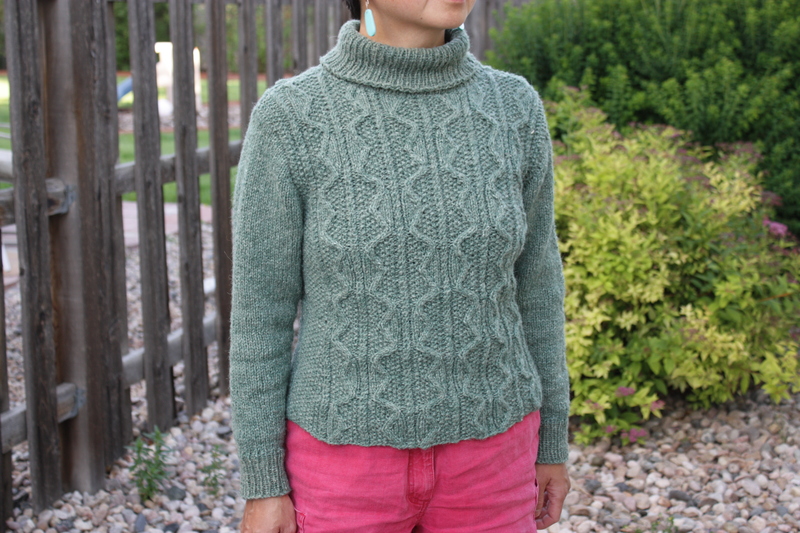 Pattern: Bedford, by Michele Wang; published in BT Fall 11, from Brooklyn Tweed. Yarn: Woolen-spun, 2-ply sport weight Cormo wool from Elsa Wool Company, in undyed dark grey. The 100% cormo is soft and itch-free for next-to-skin wear. Modifications: None, except for using lighter-weight wool. I even kept the reverse stockinette for the sleeves, even though I generally dislike the look of it. In retrospect, I should have knitted my usual size, but I thought since I was using sport weight instead of worsted weight wool, I needed to go up. I used the directions for size 39, and after blocking, the bust measurement was … 39 inches. Sigh. I love the sweater, but it is a bit floppy on me. Thoughts: The stitch pattern results in a bias fabric which did not entirely block out. I liked the simplicity of the pattern; it made for mindless knitting, but sometimes that is exactly what is needed. Modifications: Made the usual adjustments for length, so ended up with less cable repeats. 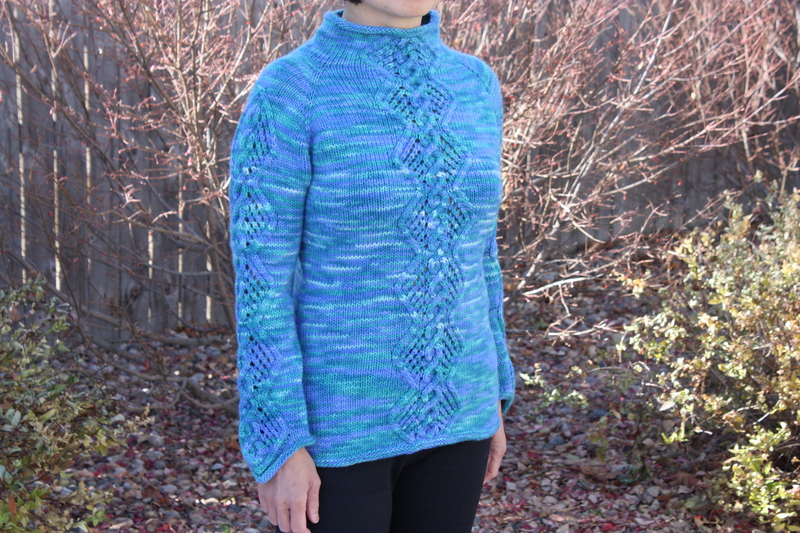 Thoughts: I am not entirely happy with the unshaped funnel neck, but aside from that, it is a beautiful sweater. Yarn: A worsted weight merino/silk yarn from Lambspun of Colorado, in sage. It has bits of glitter spun in, but since I have recycled this yarn a few times, most of the glittery bits are gone. Modifications: The fronts overlap left-over-right instead of right-over-left, and I left off the bottom buttons because I thought the cardigan looked better without them. I think I reduced the number of stitches in the left front because as written, with the buttons sewn on the button band, the front measurement would have been too generous. No pocket, because it seemed a fussy addition. Thoughts: Not sure what went wrong, but the collar does not “stand up” correctly. The button band should have been wider — it is rather flimsy as written. I love the dyed purple wood buttons I found at Lambspun!